Original Letter from George Romney writen in 1962. 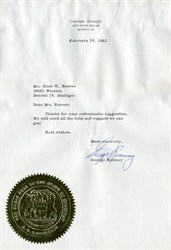 This historic document is a typed personal note to a Mr. Gene W. Reaves thanking him for his support. 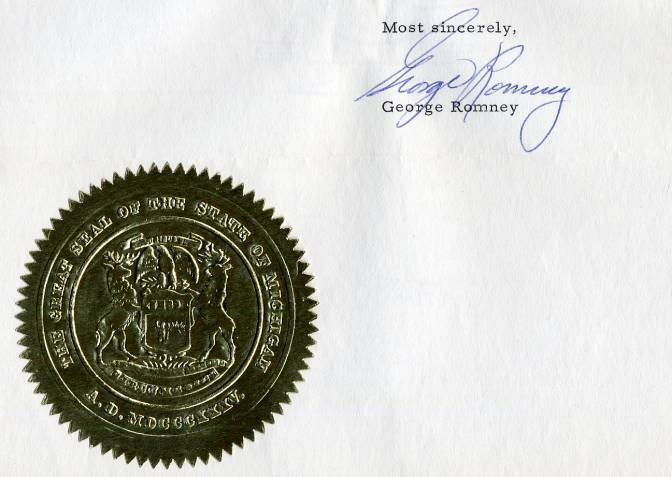 The letter has an ornate gold seal of the State of Michigan at the botton and has the original signature of George Romney at the bottom, and is over 50 years old. George Wilcken Romney (July 8, 1907 � July 26, 1995) was an American businessman and Republican Party politician. He was chairman and president of American Motors Corporation from 1954 to 1962, the 43rd Governor of Michigan from 1963 to 1969, and the United States Secretary of Housing and Urban Development from 1969 to 1973. He is the father of former Governor of Massachusetts and 2012 Republican presidential nominee Mitt Romney and was the husband of former Michigan U.S. Senate candidate Lenore Romney.